Area rugs play a big role in the appearance of a room. They break up the area and add variety to otherwise bare or even flooring. Ceramic tiled floors are clean and versatile but tend to look plain, especially in large areas. Dividing the floor by covering ceramic tile with area rugs will add texture and depth to any room. Determine which areas of the ceramic tile floor you want to cover. Also decide the purpose of the area [rug](https://society6.com/rugs?utm_source=SFGHG&utm_medium=referral&utm_campaign=8775); the best way to use one is to either place it under a piece of furniture, such as a coffee table, or to separate a large open floor plan into two areas. You can also use an area rug to cover a large part of the floor in any room. To cover up most of the ceramic tile floor, measure the entire room from wall to wall. Get a rug that will be at least 24 inches shorter than the shortest wall of the room. For a room that is 12x15 feet, select an area rug that measures 10x12 feet. For smaller areas and under furniture, measure the area where the rug will go. Always add at least five inches to the measurements of the furniture under which you will place the rug. The rug should easily accommodate the table with room to spare. Use a rug with a heavy backing made of rubberized material as this will stick to the ceramic tile floor and keep the rug in place. 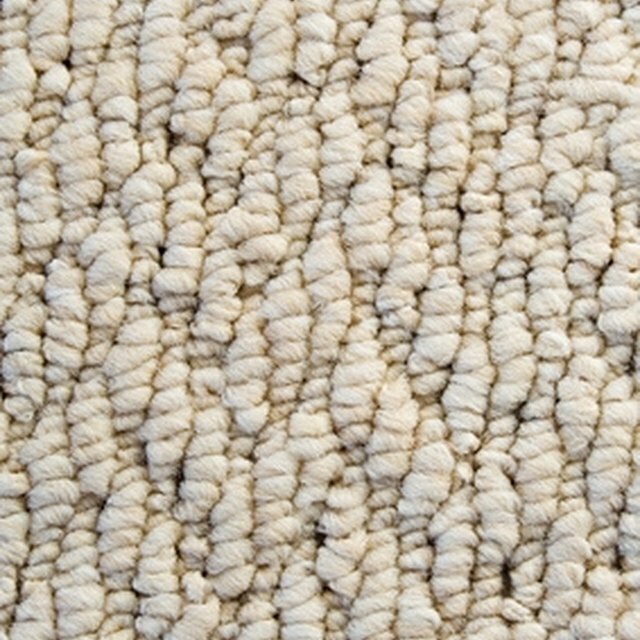 Never use a floor covering made of materials such as chenille or yarn without a non-skid backing. When stepping on these they become slippery and will cause bad falls. When selecting a rug for your ceramic tile floor, choose one that matches the color of the tiles as well as the furniture decor. If the room is light colored, a dark rug in a matching color will accentuate the rug. This will work nicely if your goal is to draw attention to the rug. If you simply want to cover an area of tile but not distract from the rest of the room, use a rug that is similar in shade and color to the floor. This will make the rug blend in. For locations that tend to get colder climates, consider a rug made of wool or nylon, especially the thick fluffy nylon type. For warmer locations, cotton, jute, bamboo, seagrass or sisal will work best. Anna Sanclement has been writing fiction and nonfiction for about 10 years. In addition to writing online articles and content, Sanclement has written a novel and contributes a monthly sci-fi and astronomy column at "Around Wellington Magazine." She holds a bachelor's degree in liberal arts from Florida Atlantic University.